Please take into account that I haven't been able to find any information directly from Atgames so I apologise if any of this information is incorrect. However, please feel free to post any new information you find here and share your thoughts on the console. I would love to get a discussion going! Haha!!! 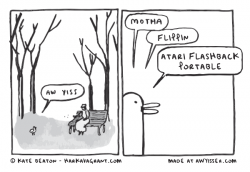 That was pretty much my reaction when I found out about the Atari Flashback Portable! Hilarious! We'll be releasing an official press release soon, but for now, all of the important information has been made available. The only real mystery is the game list, which I can't leak, but I'm sure as usual a retailer or two will have the info in their listing before the press release gets out. What I find more fascinating personally is the vitriol on Facebook by a certain segment of Atari "fans". We finally get a portable Atari 2600 with SD card slots for $40 or less (at retail) and there's still tons of hate towards it. Whether it's complaining about having the six buttons on the front (despite my clarifying that they have good reasons to be there), people stating that they already have their own franken handhelds that are better, just get an Android handheld, hey this clones the look of the Genesis portable, it looks nothing like an Atari 2600, etc., the complaints from a vocal minority are never ending. That's why it's so hard to cater to that type of audience and why products like these tend to focus on the mass market rather than the niche/connoisseur. It's either make lots of people happy with an honest effort or never make a vocal minority happy no matter what you do. Well, I for one am very excited! I suppose you can't expect a product to make everyone happy but nevertheless, I can't wait to hear more about the Atari Flashback Portable! So, do you have a part in creating this system, Bill? You seem to know a lot about it! Sorry if the answer to this is obvious. 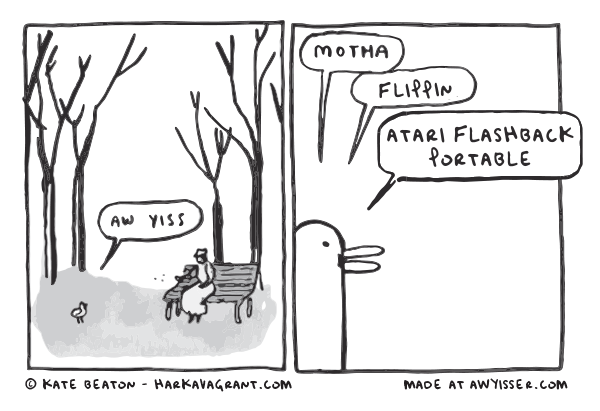 I'm just very new to Atariage and haven't really delved this deep into this community before. I see that you're an author so do you know a lot about it because of that? I'm just not excited about the MSRP everything else is fine. Every time I've bought an AtGames thing, it's been at significantly less than the AtGames Manufacturer's Suggested Retail Price. It really is a "suggestion" in this case. I'm sure we'll see it for less than $50 in the usual places. MSRP price is indeed just a list price in the case of AtGames stuff. You almost always find it for $25 - $50 max, depending upon the time of year, special sales, etc. Edited by Bill Loguidice, Fri Jul 8, 2016 8:57 AM. Yes, I'm a consultant for them. I'm not a developer, but I'm involved in most of the other areas. Definitely. There are some new retailers added this year as well, so it should be easier than ever to get the AtGames stuff. That's good to hear! I haven't seen this kind of product at Target in a while, I hope they and Amazon are on the list. Can you release the list of old/new retailers? I see. Thanks for letting me know and filling us in on some information! I just hope that it's available in the UK at a reasonable price. The only place where I have seen previous consoles of this kind in the UK has been on Funstock.co.uk and they are often quite expensive there. For example, the Colecovision Flashback costs £54.99 there which I find to be quite pricey. I am guessing that this is because Funstock has to import the consoles from another country but I'm not sure. 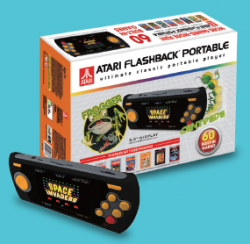 However, the Atari stuff does seem to be a bit cheaper with the Atari Flashback 6 costing £44.99 so I guess we'll have to see what price the Atari Flashback Portable ends up being for those of us in the UK. Edited by Byron's Reviews, Fri Jul 8, 2016 9:38 AM. Finally! Yes! This is sooooo going to be a day 1 pickup for me. I've been crossing my fingers for a portable Atari Flashback with an SD card slot for years now, and it's finally coming! I've been hoping that it would be made for a long time too! It's very exciting! I can't talk about the new ones yet, but I'm hoping to get them all in a future press release. Past retailers include the bigger ones like Bed, Bath & Beyond; Toys R Us, and Sam's Club, so anything new is along those same lines. If you're in the US, it won't be an issue tracking this stuff down. Does it have an in for joysticks while being played on tv? well that's just terrible! I hate this thing and anything associated with it! I'm buying the first one I see, guaranteed. Why are they complaining? Does atgames have a facebook? There's an AtariAge Facebook group (I did not realize this either). I'm still going to stick to the forums, where I can be semi-anonymous and participate in threaded conversations. Finally! I almost danced when I heard this lol.